After a balmy run up to Christmas and warm start to the new year (where we saw a few confused daffodils come out), it is finally starting to feel like a proper winter. Temperatures have dropped dramatically and we’re really starting to feel the chill. At Henry Herbert, there are three things we always keep in mind to combat the cold: fabric, layering and outerwear. The three go hand in hand to keep you toasty. In Combat the Cold Part 1 – Choosing the right Fabric, we discussed fabric choices to help insulate you against the winter chill. In Part 2, we will discuss the art of layering. It is not always the case that the thickest, bulkiest jumper is the warmest option. You might be able to achieve the same, if not better effect by selecting a few thin layers in a better fabric. Layering also traps warm air between the various layering/clothing items creating a natural insulating effect. And could come in handy when going in and out from the streets to the overly warm London Underground, or when having to deal with over-enthusiastic central heating. Keeping the torso (where key organs are situated) and chest area warm is also key to avoiding a chill. Nothing is better suited to this than a chic bespoke waistcoat – worn not just for style, but for practical reasons during such wintery conditions. So now is definitely the time to break out your three piece suit, and wear it in all its glory. The addition of a wool waistcoat is a fantastic, practical – and if we may add, stylish – way to add a layer whilst keeping the formality and sleek lines of a tailored bespoke suit. Unlike a jumper or two, a waistcoat can add warmth without restricting the use of your arms, or bunching up awkwardly underneath jacket sleeves. If you have a Henry Herbert two piece suit, and the same fabric is still in production, adding a bespoke waistcoat to the ensemble to make it a three-piece suit is a stylish solution to see you through the winter months, as well as offering you more sartorial combinations to play with. Recently, we have seen a number of extremely unique waistcoat commissions, where our customers have wanted a unique design not just for a wedding, but for use in any number of formal and casual occasions, with or without the accompanying suit jacket. 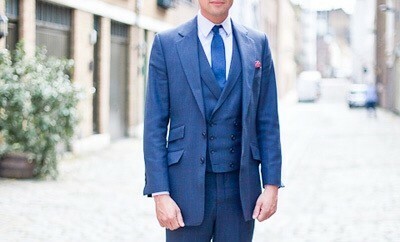 Combat the Cold - Part 2, Layering With a Waistcoat - Bespoke Suits By Savile Row Tailors. Choose a bespoke three-piece suit or add a tailored waistcoat to transform your suit from summer to winter.